Harding University thought they couldn’t find us any interns this year, and it is just as well because five of their interns were headed for a part of Africa that became unstable, so all five suddenly decided to come here instead. You can see them in the picture. Jordan is the male intern, who is staying in our house. He is a big manly guy, and when our toddler Faith said, “Jordan is my sister,” she was pleasantly surprised to find that she had made a funny joke. She has never had a brother, so I think she meant that Jordan already feels like part of the family. 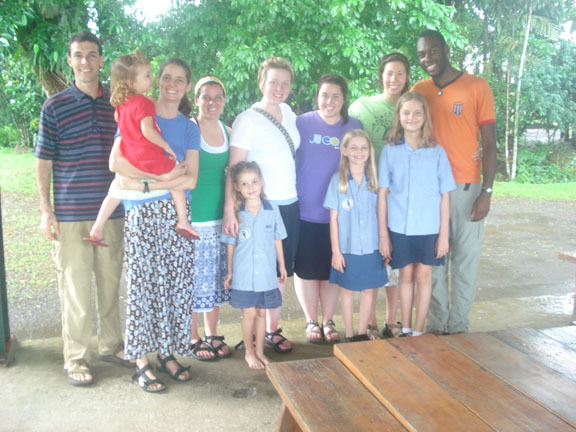 The kids also love the four female interns: Auburn, Erin, Samantha and Tessa, who are staying at the Ford’s house with a local Christian “dorm mother,” Susan. All the interns got off to a good start. They have already been teaching, doing research, learning language, and shadowing at the hospital, and they’ve only been here for a few days. Pray that their five weeks will be great for them and for the work here. In an earlier report I mentioned “rats, tooth problems, ticks on the dogs, and a broken washing machine.” Let us give thanks that all of these have been resolved! We found and blocked the rats’ entrance, Diane took Rochelle to Australia for dental work (with financial help from a friend), we received effective medicines for the dog’s ticks (from another friend), and the needed part came in for the washing machine. Thank you for your prayers and love. God is good. The Fords are away for four months (April-August), after which they plan to return for about six months. Leslie Williams is scheduled to arrive here on Saturday for a short visit. Please pray for all of them–and for us while they’re away. Evangelism was slow during April and May. Please pray for that. I find it hard to get out with new people as much as I used to, partly due to the lack of missionaries, the needs of the churches and training program, and now interns. I have been encouraging the Christians to do more on their own. Please pray that they will. Pray for Wesley Eyasi, who was baptized in May. Diane is doing a new weekly class for some women out of town–a wonderful and needed ministry. Pray that she will not be too stretched! The kids have had a spurt of birthdays, so they are now 11, 9, 6, and 3! Please pray for our family, especially that we will be pleasing to God. This entry was posted on June 10, 2011 at 5:59 pm and is filed under Baptisms, Local situation, Our family. You can follow any responses to this entry through the RSS 2.0 feed. You can leave a response, or trackback from your own site. Lots of exciting things going on in PNG! Even during this transition in work and team, we still see God moving in you as you continue making such an impact on His kingdom. I, one of the missionaries from the aforementioned temporarily destabilized african nation (Burkina Faso), am glad that the harding interns found a good place to go. I’m glad that our loss (of interns) has meant a blessing for you and your family. Hi, Aaron! Fancy running into you in the blog world. 🙂 Having intimate knowledge of the Reese’s and even having the blessing of having been to see the work there in PNG, I can promise you the interns were in very good hands. Keep up the good work you are doing in Burkina Faso and I hope things are calm enough for new interns next go around. Tell Andrea hello.